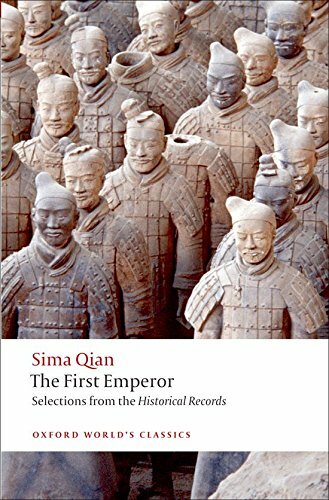 The First Emperor: Selections from the Historical Records by Sima Qian, translated by Raymond Dawson is an abridged version of Sima Qian's much longer history. Sima Qian (145-86 BCE) is known as the Grand Historian of China and an important resource on Chinese history. His books are available in a set of four or two, and then there is this slim volume which provides a reader with a very clear view of the Qin Dynasty (221-206 BCE) and the First Emperor Shi Huangti (259-210 BCE). This is not a comprehensive history of the Qin Dynasty but a selection of some of the most important passages, which are joined by a brief commentary by the translator Dawson. The table of contents includes: The Birth of the First Emperor, An Assassination Attempt, The Biography of the Chief Minister of Qin, The Builder of the Great Wall, The Annals of Qin, and the Treatises all having to do with the Qin, and then two final chapters on the rebels Xiang Yu and Chen Sheng, who come after the Qin. Xiang Yu is best known for his tragic defeat at the Battle of Gaixia in 202 BCE by Liu Bang who founded the Han Dynasty afterwards. The whole book is very interesting because Sima Qian was a great storyteller and Dawson translates the work so well it reads like an adventure story. Chapter Three on The Biography of the Chief Minister of Qin is especially interesting because it deals with Li Si, emperor Shi Huangti's minister, who was responsible for many of the Qin Dynasty's policies. The chapter begins with a story about Li Si in his youth watching rats eating filth. He noticed that if the rats were in one location, like public bathrooms, they were afraid of the approach of people and ran away, but if they were in a storehouse, they were not afraid of people and were even aggressive. His observation of rats taught Li Si an important lesson: "A man's status is just the same as with rats. It simply depends on where one locates oneself!" Li Si went on to locate himself in the best positions of power after the fall of the Qin Dynasty until his death. It is interesting to read a behind-the-scenes glimpse of this man, particularly because he had such a great influence over the policies of the Qin and was responsible for the burning of books and execution of philosophers and writers. The First Emperor was not happy, and he made the scholars of broad learning compose poems about immortals and true beings and also on wherever in the Empire he went on his travels, and musicians were instructed to sing and play them (78). Shi Huangti had already banned all books which were not related to Legalism or the Qin Dynasty or the emperor's personal history. Forcing scholars to write poetry and musicians to sing the poems to cheer him up is in line with many other demands the emperor made on the people and his court, but Sima Qian gives a reader an idea of why he acted as he did. To him, the scholars' "broad learning" was of no value so they were better used to entertain him. The musicians needed something to sing so the scholars' skill with words could be put to some practical use. The last two chapters on Xiang-Yu and Chen Sheng relate the fall of the Qin Dynasty and are very exciting reading. The Qin Dynasty had never really served the people but got progressively worse the longer it held power. The rebellion against the Qin is told through the stories of two of the rebel leaders who remain legendary figures today in modern China. This book is highly recommended for anyone interested in Chinese history, but it is also just very entertaining reading. The action of the book moves quickly, and it does not read like an academic history book at all. Sima Qian was a very good writer and Raymond Dawson does a great job translating his work. This volume includes a section of Explanatory Notes, an Index in the back, and an interesting preface and introduction at the beginning. If you don't want to spend the money on the four-volume set of Sima Qian, or if you just want to see how he writes before committing, this is the book you are looking for. Qian, Sima. "The First Emperor: Selections from the Historical Records (Oxford World's Classics)." Ancient History Encyclopedia. Last modified February 19, 2016. https://www.ancient.eu/review/103/. Qian, Sima. "The First Emperor: Selections from the Historical Records (Oxford World's Classics)." Ancient History Encyclopedia. Ancient History Encyclopedia, 19 Feb 2016. Web. 18 Apr 2019.